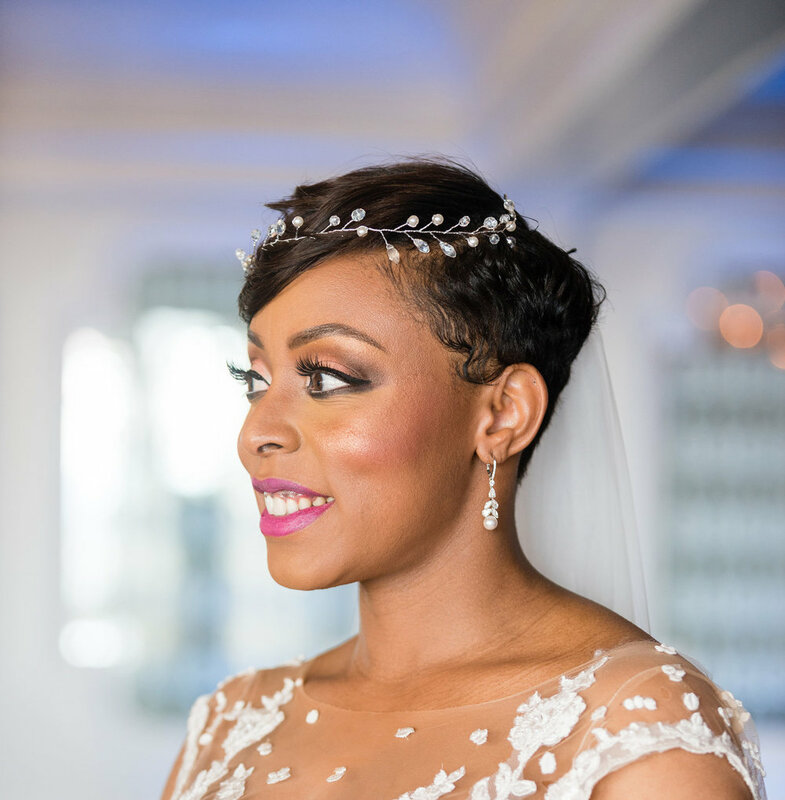 Wedding Hair and Makeup for Black Women: How to Choose Your Beauty Team for Your Wedding Day — . This month, I will be celebrating my first wedding anniversary! I can't believe it's already been a year. To celebrate, I will be doing a wedding series to share a few tips and tricks I learned while planning my wedding. In this first installment of the series, I'm sharing how to choose a wedding day hairstyle and makeup look. During my search for inspiration, I needed to see photos of people who looked like me with hair like mine hence this post - wedding day hair and makeup for black women. I do hope that these tips help you (or a friend or family member). Enjoy. For more wedding planning tips, watched this video my husband and I created about how we planned our wedding in six months. Now here are my wedding day hair and makeup tips. Before I made the final decision regarding my wedding hair and makeup, I spent a lot of time finding and saving photos of hairstyles and makeup that I liked. I created a wedding hair and makeup inspiration Pinterest Board solely to save these photos. Thanks to Instagram, Pinterest and Munaluchi Bride (a multicultural wedding website) finding inspiration was relatively easy. Over time, I noticed that the photos I saved had a particular feel. I wanted simple elegance mixed with glam. With that in mind, it was time to choose my wedding beauty look. For my wedding day hair, I narrowed down my choices to styles that I thought would flatter my face. After all, we all want to look great on our wedding day! I wore my hair in a short pixie for a number of years and knew that short hair flattered me, so I decided to go short for my wedding day. Plus the short style worked with my wedding dress, accessories and overall theme of my wedding. For my makeup, I opted for an "elegant glam" look. After viewing my makeup artist's portfolio, I knew exactly the look I wanted on my special day. Some people are talented and do their own hair and makeup on their wedding day. For me, I called the professionals. I had a prior relationship with the stylist who styled my hair for my wedding. She styled my hair before, and I trusted her. While she was not available to style my hair on my wedding day, I made arrangements for her to do my hair the day before my wedding and my cousins freshened up my style on my wedding day. Availability is key in booking a stylist. Also, speak about pricing to ensure that it works with your budget. I found my makeup artist via Munaluchi Bridal website. I used Munaluchi Bridal to search because I wanted a makeup artist relatively close to my wedding day venue who also had experience doing wedding makeup on brown skin. The website pointed me to my makeup artist's Instagram portfolio, a short portfolio view and I was hooked! Her makeup artistry vibed with what I wanted on my wedding day. While everyone told me to do a makeup trial, I did not. Luckily, it worked out well for me. I felt good about booking her based on her friendliness and professionalism when I reached out and her reviews and reputation (I also chose my bridesmaids' makeup artist based on her reputation because one of my bridesmaids worked with her previously). A few of the vendors I was working with knew her and spoke highly of her work. Nevertheless, many people advise brides-to-be to do a trial so there're no surprises on the wedding day. Now that you've chosen your wedding day beauty team, work out a wedding day timetable with your hair stylist and makeup artist so that everyone can work together to ensure things go seamlessly on your wedding day.